After our cold and prolonged reluctant spring and our week-long monsoon rain, summer is finally here. The strange weather shortened the spring outfitting season. Of course, once the sun finally came out and the temperature started to go up, everyone wanted their boats ready, so it’s a busy early season for all. 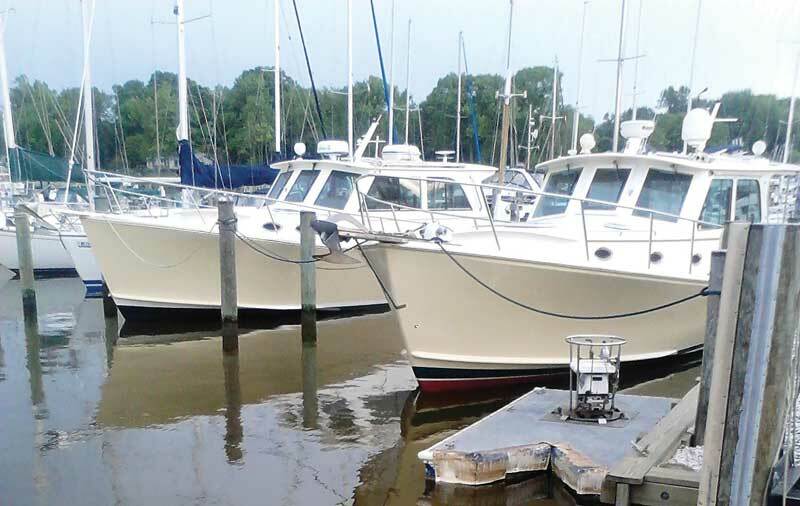 Meg at Mathews Brothers Boats in Denton, MD, reports that they are busier than ever. Once the usual spring rush was over, they started construction on a new Eastport 32 in the shop. In addition, the next phase of the Educational Passages project has begun, and they are turning out many more of the miniature boat hulls for this worthy endeavor. 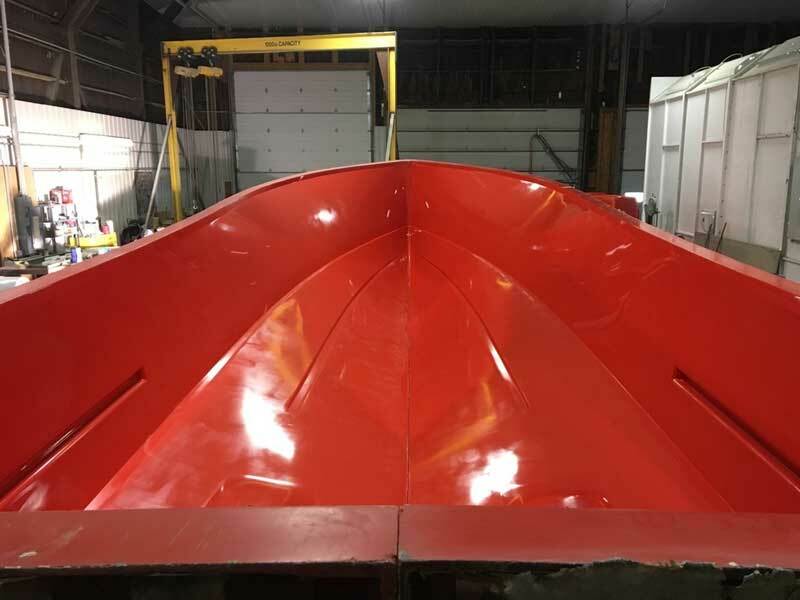 The first step in constructing a new Eastport 32 is cleaning and polishing the mold at Mathews Brothers Boat Works in Denton, MD. Thomas Point 43 Sawdust and Thomas Point 40 Regina Marie newly launched after winter refinishing and ready for the season at Mast and Mallet in Edgewater, MD. 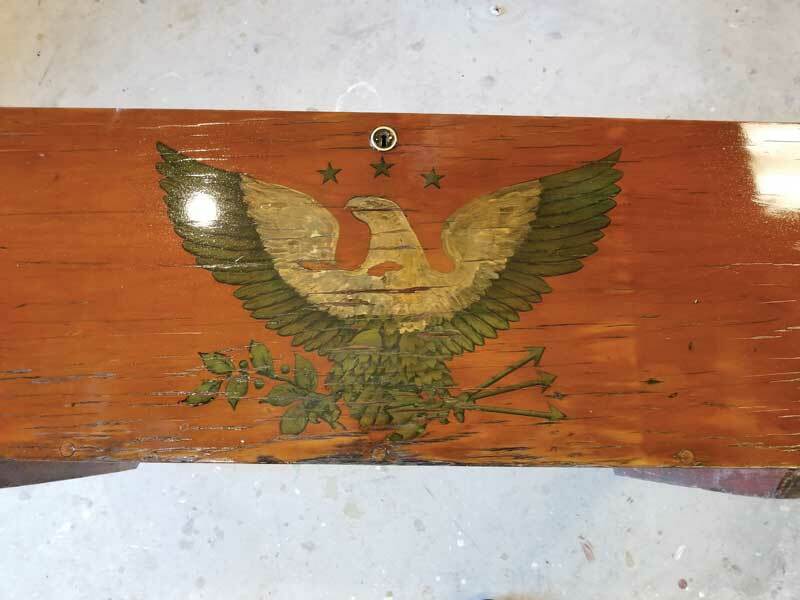 An American Eagle design, estimated to be 55 years old, uncovered during refinishing of a Boston Whaler console at Classic Watercraft Restoration in Annapolis, MD. Tracy Johns of the Chesapeake Bay Maritime Museum (CBMM) in St. Michaels, MD, shares the following with us: “CBMM’s Rising Tide After-School Boatbuilding students recently launched two newly built outboard skiffs. 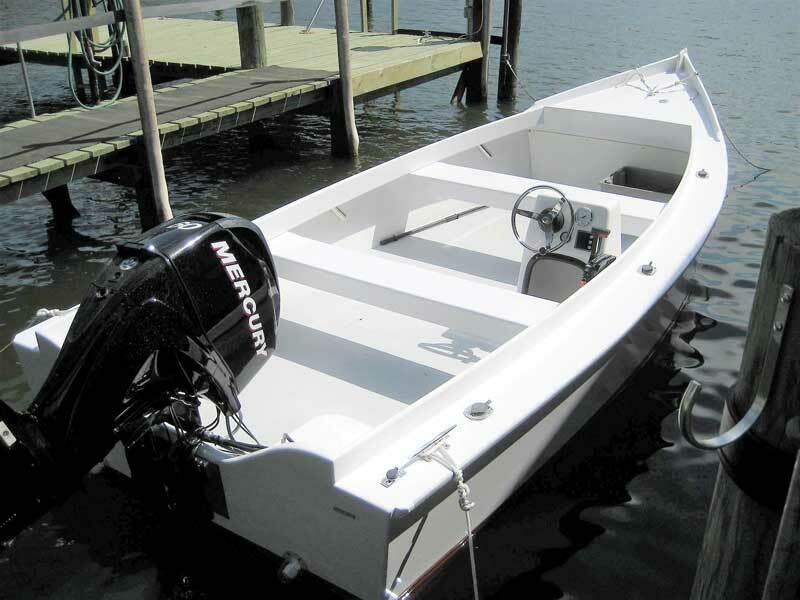 The nearly identical 17-foot, flat-bottom skiffs are based on traditional Smith Island designs. The design was simplified in some areas to make the boats easier for the youngsters to build. They are cross-planked and constructed of yellow pine. Nearly 30 students participated in the build, which began mid-September, 2017. Rising Tide offers free boatbuilding classes, workshops, camps, and events throughout the year for students in grades six to nine. Students in the program have been constructing the two skiffs, named Mary and Susan (for Maryland flag and blacked-eyed Susan designs painted on them) since last September. 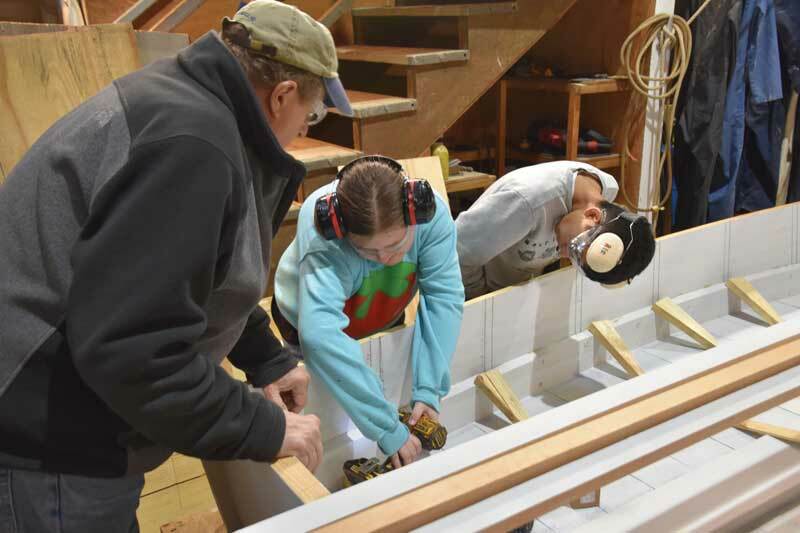 Rising Tide volunteer Ned Henninghausen supervises program participants Ava Reid and Jonathan Storch working on the 17-foot skiff Mary at the Chesapeake Bay Maritime Museum’s shop in St. Michaels, MD. Back in the fall of 2016 we reported on the beginning of a project by John Cook of Hollywood, MD, to build a Chesapeake Log Canoe. 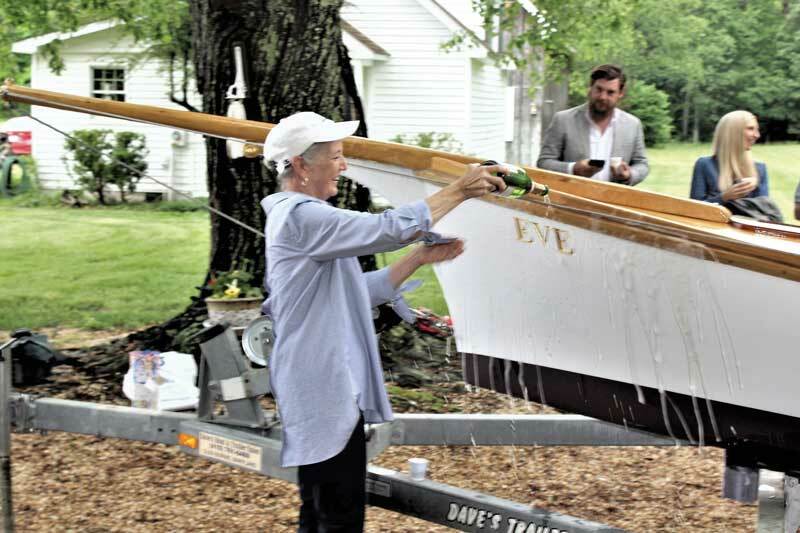 Working largely alone, evenings and weekends, John patiently turned a block of five pine logs into a graceful and elegant 20-foot log canoe named Eve in honor of his wife, Eve Love. Late this spring the canoe was christened and launched and will soon be sailing the waters of the St. Marys River. Eve is a Tilghman Island style canoe. While most canoes were workboats, the Tilghman Island style is a relatively late development with fine lines and large sail plans designed primarily for racing. She joins a fleet of less than 20 log canoes still sailing. John hopes to rekindle interest in the log canoe building process and interest more people in building and racing these historic vessels. Log canoes are unique to the Chesapeake Bay, and their construction was probably inspired by the dugout canoes used by Native Americans when the first colonists arrived on the Bay’s shores. Speaking of unique forms of construction reminds me of Rionholt Once and Future Boats, located at Gwynns Island Boat Yard in Mathews County, VA. Eric Rionholt builds reproductions of traditional Chesapeake craft such as skiffs and sharpies. What makes Eric’s boats unique is that they are constructed of one inch PVC panels. No wood is used, not even for trim. According to Eric, this completely does away with the problems associated with wooden boats and cuts maintenance costs to the bare minimum. A Rionholt Boats 20-foot trap skiff reproduction built entirely of PVC plastic built at Rionholt Once and Future Boats in Gwynn’s Island, VA.
Nancy Noyes reports the challenging weather did not dampen enthusiasm for Chesapeake Light Craft (CLC) of Annapolis’s annual OkoumeFest event. “While a WoodenBoat School build-your-own Sassafras Canoe class was finishing up in the workshop, we cleared out space in our CNC shop for a series of technical seminars. Boat builder and CLC alumnus Joey Schott demonstrated the finer techniques of epoxy filleting and varnishing; designer/builder/instructor Eric Schade of Shearwater Boats shared tips and tricks for perfect fiberglassing; Tony DeLima of Forte Carbon discussed the application of carbon fiber; and kayak design and building legend Nick Schade of Guillemot Kayaks showed how to build a skin-on-frame boat. Visiting instructor Eric Schade of Shearwater Boats demonstrates the best way to apply fiberglass at Chesapeake Light Craft in Annapolis, MD. 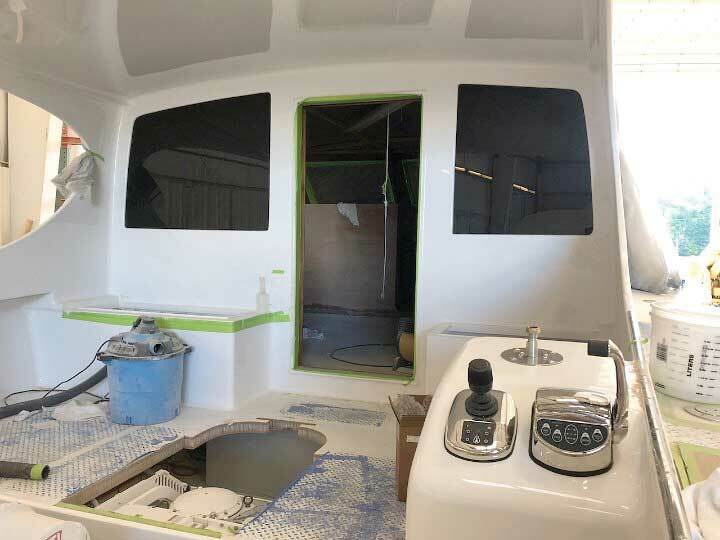 Weaver Boatworks in Tracys landing, MD, has three projects going on at the moment: the completion of interior and fitting out of the Weaver 97 DC, the completion of the second Weaver 43 Chesapeake-style boat, and new construction on a Weaver 70 TS. The amidships steering station on a Weaver 43 Chesapeake Style under construction in Tracys Landing, MD. We wish all our readers a safe and sane Fourth of July and a great boating summer.